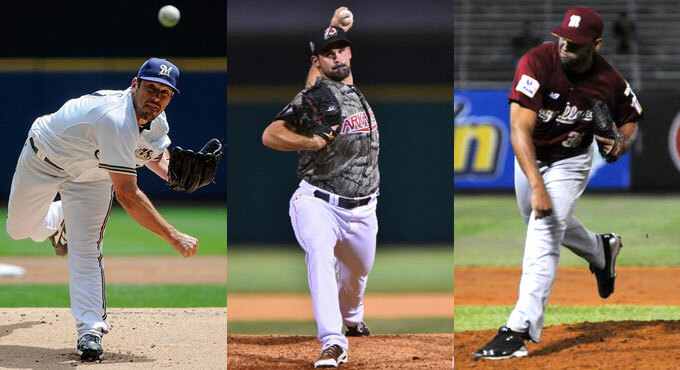 (Central Islip, N.Y., April 6, 2015) – The three-time Atlantic League champion Long Island Ducks today announced the signings of pitchers Mark Rogers, Carmine Giardina and Amalio Diaz. Rogers will begin his first season with the Ducks and second in the Atlantic League, while both Giardina and Diaz make their Atlantic League debut. Rogers comes to Long Island with two seasons of Major League experience. He was a member of the Milwaukee Brewers during the 2010 and 2012 seasons, combining to pitch in 11 games (nine starts). The right-hander posted a 3-1 record with a 3.49 ERA and struck out 41 batters over 39 innings of work. He made his Major League debut on September 10, 2010 and retired all three Chicago Cubs batters he faced in the ninth inning. The Maine native was originally drafted in the first round (fifth overall) by the Brewers in the 2004 amateur draft. He began the 2014 season with Tacoma (AAA, Mariners) and went 1-0 with a 3.86 ERA in two games (one start). Following his release, the 29-year-old was signed by the Lancaster Barnstormers and compiled a 5-6 record with a 4.17 ERA in 18 starts. Rogers has played nine seasons of professional baseball and pitched in spring training this year with the Texas Rangers. Giardina, a native of Manhasset, N.Y., brings four seasons of professional baseball experience to the Ducks. He spent the entire 2014 season with Arkansas (AA, Angels), appearing in 49 games out of the bullpen. The southpaw accrued a 2-1 record with a 4.45 ERA and 45 strikeouts in 56 and two-thirds innings of work. For his efforts, he was selected to play in the Texas League All-Star Game and tossed a scoreless inning of relief in the North All-Stars’ victory. The 27-year-old spent the first three seasons of his career in the Angels organization as well. In 141 career games (six starts), he has a record of 11-10 with a 4.23 ERA and 199 strikeouts in 191 and two-thirds innings of work. He split time in college with the University of Central Florida and University of Tampa, combining to pitch in 59 games (25 starts). Giardina was drafted by the Angels in the 15th round of the 2010 amateur draft. Diaz makes his Ducks debut with nine seasons of professional baseball experience. He last pitched in the 2014-15 Venezuelan Winter League with Navegantes del Magallanes. In eight games of relief, he compiled a 1-0 record with a 2.84 ERA and eight strikeouts in six-and one-third innings. The right-hander’s efforts helped Magallanes to an appearance in the Venezuelan League Championship Series. In 2013, he appeared in 25 games with Washington of the Frontier League and posted a 2.00 ERA along with six saves and 28 strikeouts in 27 innings of work. The Venezuela native has spent time in the Los Angeles Angels and Los Angeles Dodgers organizations, reaching as high as Triple-A with the Angels in 2010 and 2011. His best season came in 2012 with Joliet of the Frontier League and Great Lakes (A, Dodgers). He combined to go 2-1 with a 2.76 ERA and totaled career highs in games (39) and saves (19) while striking out 45 batters in 45 and two-thirds innings. The 28-year-old has a career record of 36-40 with a 4.38 ERA, 33 saves and 531 strikeouts in 266 games (84 starts). Diaz was originally signed as a free agent by the Angels in 2005.